Grew Up… with dreams of making it big in Los Angeles, but much has changed for Ms. Bracken. She’s still in show business (sort of), but not quite the kind that she longed to work in. Living… in 1950s Tinseltown – L.A. – where it’s difficult to tell the real cops from the ones who just play them on TV. Lynn may look glamorous, but she leads a sad and sordid life in this city of sun. Profession… call girl. Lynn works in the oldest profession for a sleazy pornographer named Pierce Patchett. She has a special talent, too. Like all of Patchett’s girls, Lynn looks like a contemporary celebrity; in her case, actress Veronica Lake. Unlike the other girls in Patchett’s harem, Lynn didn’t need to go under the knife to get her looks. Save her for bleach blonde hair, she’s all-natural. 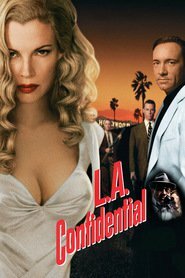 Challenge… helping Bud and his stuck-up colleague Ed Exley solve a crime that goes deep into the heart of L.A.’s underbelly. Lynn knows more than she lets on. Once you get past her jaded cynicism, she’s actually a tender soul looking to help the cause of justice. Personality… beautiful, smart, and jaded. At first sight Lynn appears to epitomize the notion of the femme fatale: her red lipstick, curly blond hair, killer figure, and pouty expression make her enticing to any man. But upon closer inspection, Lynn is more than a woman with a lost dream of becoming an actress. She’s one tough dame. Lynn Bracken's popularity ranking on CharacTour is #1524 out of 5,000+ characters. See our top-ranked characters and read their profiles.